Well, this isn't Top Chef, it's just my blog, and a couple weeks ago, I decided to buy some scallops that were "Eco-OK". I've been trying to incorporate fish into my diet more frequently to increase my protein intake and have a more balanced diet, but I've also been interested in understanding the idea of sustainable fishing. I won't go off on a rant about sustainable fishing right now (I'll be writing an article on that for my Science Writing class later in the semester, so you can hear about it then), but for now, let's just say that I decided to buy the scallops. Having purchased the scallops from my trusty local Whole Foods, I needed to find a good way to prepare them, so I turned to my favorite Top Chef Master, Rick Moonen's cookbook Fish Without a Doubt. Since I purchased the scallops spur of the moment, I didn't have a recipe in mind so I looked for one that took advantage of items I already had in my cupboard. 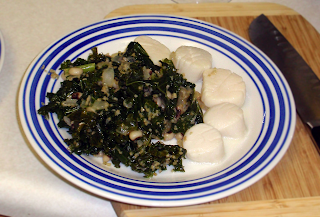 I settled on Rick's recipe for "Butter-poached Bay Scallops" using his "Garlic Butter Sauce." Since I don't want to violate any copyright laws, I'm not going to post the recipes, but I'll give you the gist. I made a butter sauce on the stovetop using shallots, thyme, garlic and of course, butter. I then cleaned the "feet" off the scallops and dumped them in the sauce. I let them poach over low heat for several minutes until they looked opaque. Since, I didn't really have any experience cooking scallops, I sort of just guessed when I thought they were "done." Neither Rob nor I got sick and they tasted yummy, so I think I did okay. To accompany my buttery shellfish, I made some sleek. I happened to have some kale on hand since my seasonal food calendar told me it was in season so I had bought some. I found this recipe for sleek online. The recipe called for 1 1/2 lb kale, but I just used the bundle I had in the fridge. Also, I didn't measure out the onion, instead I just chopped up 1 average size vidalia onion. If you've never tried sleek before, you must do as soon as possible, and it is fairly easy to make at home and doesn't require many ingredients. I always use Rob as my gauge for how appealing veggie dishes are to the general populous as he can be quite picky, and he enjoyed this recipe. It may not have been a Top Chef worthy meal, but it just may be a dish worthy of Top Scallop.